Sexually touched up in Delhi. Again. This morning, I was part of a big group of runners, celebrating the end of our #100daysofrunning challenge, and a lovely morning it was, too. Hot as hell, horrifically humid, but great fun. Here’s the link to the photos of our morning in my running blog. The short tale I am about to tell now, however, is – sadly – not related to running, but to sexual molestation. We were a group of – what? – about 50/60 runners and we met at India Gate, in the absolute heart of Delhi. India Gate is the national war memorial, and always has cops on duty there. There is even a makeshift police post there. Note this latter fact, please, since it has a direct impact on what I’m about to tell you. So, yes, India Gate this morning. Busy busy busy, with not just our group, but loads of other runners and cyclists. We were all standing around chatting and eating cake after our run, and I was standing with two charming youngsters, Seema Yadav (happy birthday for yesterday) and Mohit Bhutani. A man was hanging around – scruffy looking but not out-and-out filthy beggar-ish, if you see what I mean. He spoke some English and kept asking me questions (was I an American, what time was it, that kind of stuff). But, to be honest, I’m used to being asked questions all the time in India, simply by virtue of being a foreigner. There was nothing overly creepy about the man, just a tad weird, but still we moved away from him. He followed us. But we were a large group, and people in India always hang around and see what’s happening, so this man just seemed like your usual poor hanger-on type. Until he reached out and touched my breasts. And then ran away at top speed. I screamed and gave chase, and this, remember, is all taking place about 10 metres from India Gate, with the police detail. I yelled out for someone to stop him, and a cyclist did precisely that (thank you whoever you are) and when I caught up with the creep I whacked him a couple of times and kicked him (but sadly not my trademark kick in the balls for molesters like him). Several of the wonderful, utterly fabulous young men from our #100days running group immediately ran over and intervened. And I guess it was about this time, with several men thumping the bloke, that the cops s-l-o-w-l-y wandered over. I left the scene at that point, and rejoined our group, but the whole thing left a nasty taste. I was lucky enough today to have wonderful fit young men watching out for me, but had I been alone? The seeming lack of interest on the part of the cops left me in no doubt that had it not been for the great blokes in my group, nothing would have happened to this sleaze bag. If he feels he can reach out and touch a woman of my age, God help any little girl he encounters. Under the noses of the cops. The only light-hearted moment came when one of the runners pointed out that my #100days training had definitely helped me sprint after my molester in super quick time. 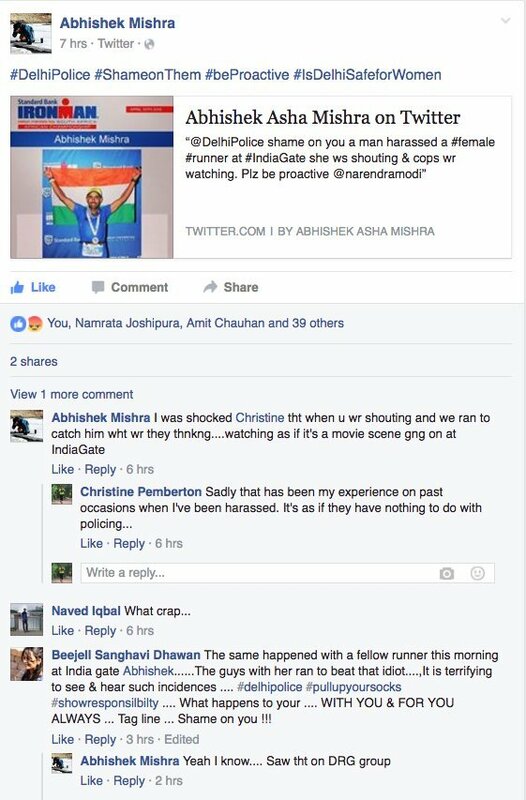 My friend Abhishek took to Twitter & Facebook to voice his outrage, for which I thank him and all the other fab men in our group. 57 comments to Sexually touched up in Delhi. Again. It is indeed shocking and makes all of us women worry about how safe we are in public spaces. Since the cops on duty did not seem to respond, this incident should be brought to the knowledge of the Police Commissioner of Delhi so that they are held accountable. Shocking. Shocking. But so proud of you. This is absolutely ridiculous. So glad that you were able to get to him and set him straight Christine aunty. Brave brave woman! Glad that the man was taught a lesson. Hope no one has to endure this ever. How absolutely horrible, Christine. I am so ashamed that you had this terrible experience. It is just so sad when those who should be enforcing the law choose to look away.